LATHAM — Aurora Games organizers announced Wednesday, Jan. 23 that three-time Olympic gold medalist Jackie Joyner-Kersee and five-time Olympic gold medalist Nadia Comaneci will serve as honorary captains of the inaugural all-women’s sports and entertainment festival. The internationally-renowned sports figures appeared in Albany in celebration of the upcoming Aurora Games, which the Times Union Center will host on August 20 to 25. The games are expected to welcome in professional athletes, coaches and trainers from more than 15 countries for the six-day event. The event will include team and individual competitions such as basketball, tennis, figure skating, gymnastics, ice hockey and beach volleyball. As honorary captains, Joyner-Kersee and Comaneci will each guide athletes for their respective teams. Joyner-Kersee, an American track and field icon, will lead Team Americas. Comaneci, the legendary Romanian gymnast, will guide those competing for Team World. 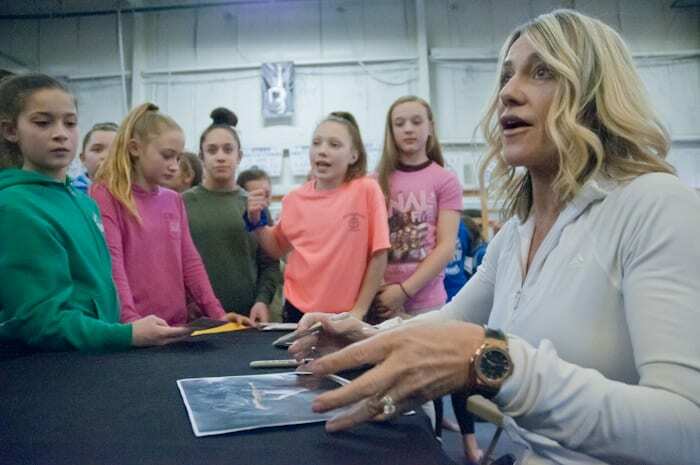 After a press conference announcing the games at the Times Union Center, Comaneci spoke with gymnasts at the World Class Gymnastics Academy in Latham. Joyner-Kersee was also spotted as she visited.